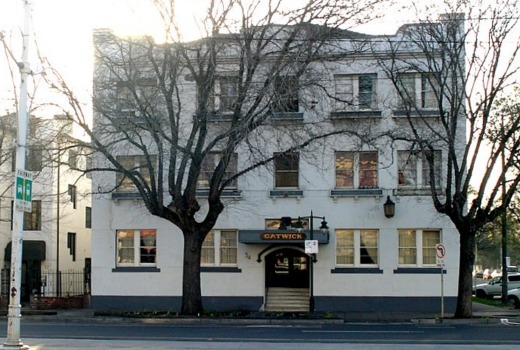 Media are now wising up to a rumour TV Tonight ran a month ago that The Block producers are keen on The Gatwick Hotel in St. Kilda. The Herald Sun ran an “Exclusive” with further speculation, now joined by The Age, that the notorious residence could be a potential site for the 2017 series. The 64-room 1930s building has been a low-cost boarding house since the 1950s, but attracts some of the area’s more colourful characters who would need to be relocated. It has also been the scene of murders, drug raids and stabbings. It was taken off the market in October after failing to find a buyer for its pricetag, believed to be over $11m. Reports now suggest a deal with the owners of the building has been struck in principle and paperwork lodged with lawyers is to be signed off. TV Tonight has previously tipped future Block sites including South Melbourne 2012 and Richmond 2011. Remember when they used to just buy 4 small houses next to each other and give regular couples a week to renovate a room and then film them doing it?. Sad to see a low cost boarding house turned into luxury apoartments most locals could probably not afford. Sadly it’s the same story in cities the world over. Another site wear cheap labour is used to reverbish buildings ! Credit to Nine for spotting the potential! To a lesser extent 7 Network. Austrian authorities have recently seized a dilapidated hotel that was Adolf Hitler’s birthplace-perfect for a Block ‘that will last a thousand years’! Gotta love those apparent exclusives that aren’t actually exclusives. If Aleks Devic won’t give you the credit you deserve David than I am more than happy too. TV Tonight is the only place for television news and views. The producers claim its their biggest Block yet but can’t be bigger than the recent Soap Factory Admin building? True. This year’s one was huge.